4TH QUARTER – Today is THE FIRST DAY of the 4th quarter, hornets – the last nine weeks of the 2018/2019 school year. Today is also the first day of our Smarter Balance testing and block scheduling. There are bell schedules in the halls and some available for you to pick up here at the front offices. The main thing is to just take your time as your begin testing and not rush through it all. Contrary to poplular belief – your scores do matter. Especially for our 8th graders that will be heading to the high school next year. Block scheduling does take a little to get used to, but just remember that it is just for the next two weeks while we test. Block scheduling allows you the time in classes to get your assignments finished and ask the teacher for help if you need it. Which is really great as we begin this new nine weeks! Rock the tests, hornets! 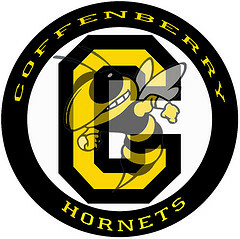 TRACK MEET AND TEAM PICTURES – Thursday this week is our Coffenberry track team’s first track meet! Thursday is ALSO the day of team pictures before the team leaves for Douglas High School for their meet. Coach Nutter will be passing out picture forms to you this week. SCHEDULE CHANGES – Hornets, please plan on going to ALL of your classes today. There will be no schedule changes made or requests taken today. WORD OF THE WEEK – Perseverence; which is a continued effort to do or achieve something despite difficulties, failure, or opposition.